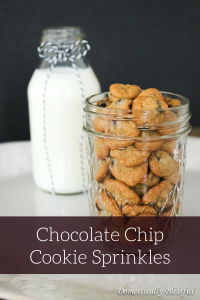 I can not even begin to express how amazingly delicious these chocolate chip cookies taste. My mouth waters just thinking about them. I debated over several names to describe these cookies from perfect, to greatest, to divine, to superb – the list goes on and on – but Roger and I finally decided on The Ultimate Chocolate Chip Cookies. 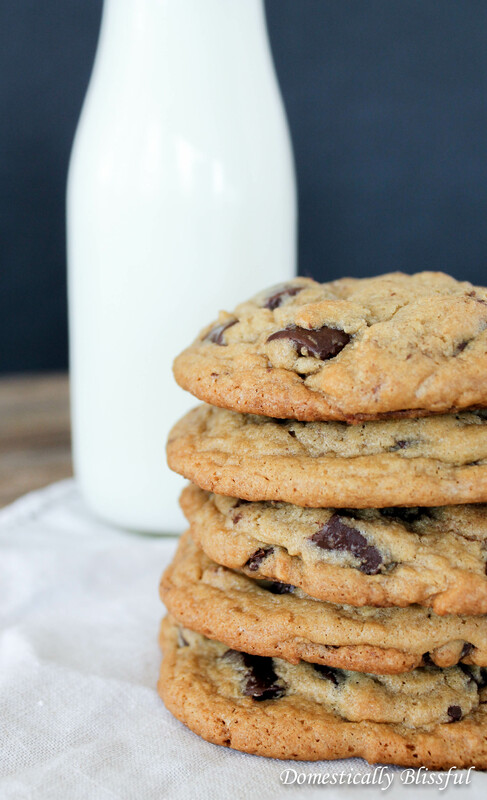 These Ultimate Chocolate Chip Cookies are so perfectly moist and chewy they will be devoured before they even get a chance to cool. While some cookies taste very sugary – like you are eating just sugar – or they have a distinct oily or buttery texture/flavor, these Ultimate Chocolate Chip Cookies have a well rounded full cookie flavor. They are not too light and airy but they aren’t dense and hard. 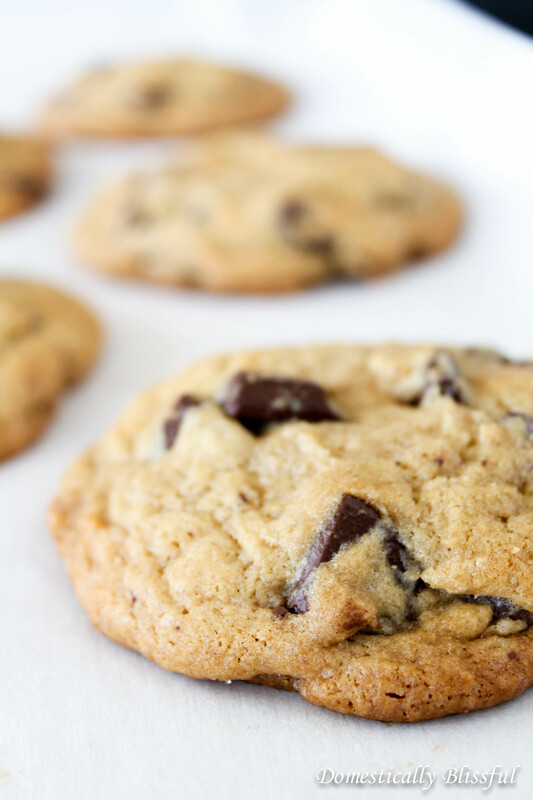 These chocolate chip cookies are perfectly chewy and melt-in-your-mouth moist. They taste nothing like a refrigerated cookie but everything like a perfect homemade chocolate chip cookie should – one that you can’t stop eating. You can’t help but feel giddy and well satisfied while eating these perfectly baked cookies. After eating one – or two – of these large warm cookies your stomach doesn’t feel heavy and you aren’t left with a bad taste in your mouth like some cookies will give you. The sweetness of the cookie is perfectly balanced with the bittersweet taste of the chocolate. The density of the warm melted chocolate blends perfectly with the chewy density of the freshly baked Ultimate Chocolate Chip Cookie. 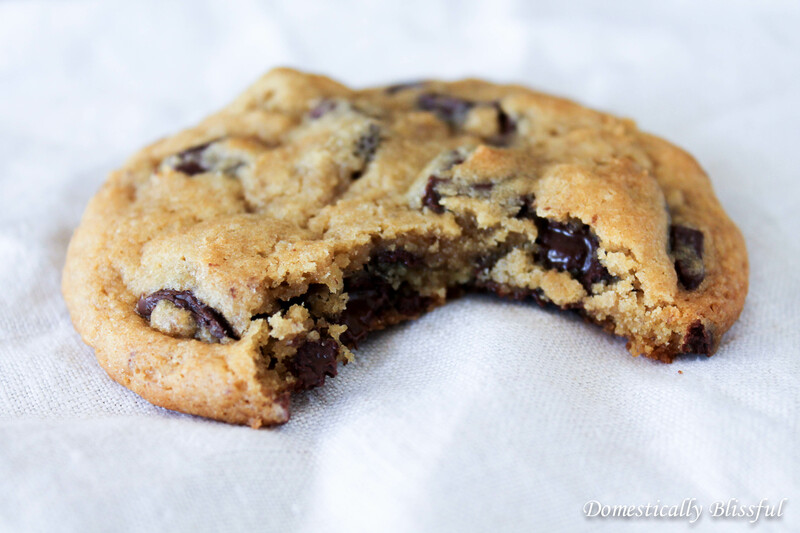 I know I might have teased you all a little too much with this cookie recipe, but I spent a good amount of time researching, testing, and tweaking my recipe until it could seriously deserve the name The Ultimate Chocolate Chip Cookie. 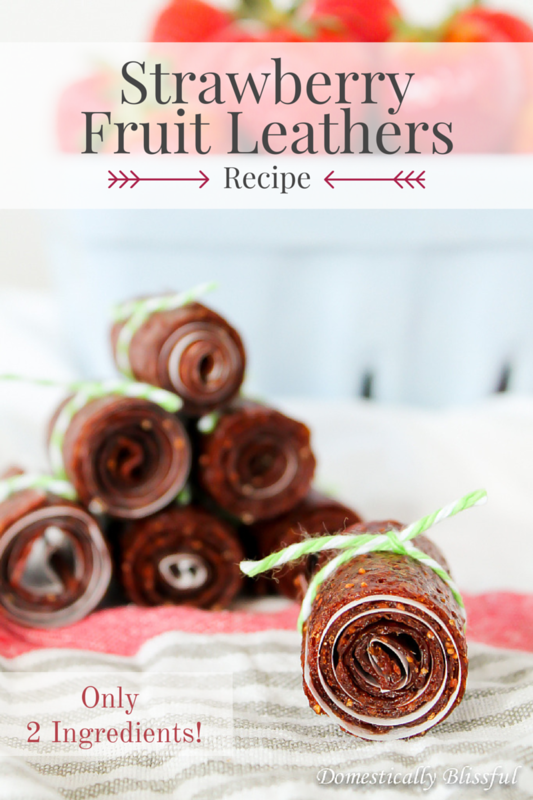 There is quite a bit of information below describing the recipe, variations, the reasons for measurements, and tips for the perfect cookie. You can easily read through it, skim it, or even skip it – that’s completely up to you – I just couldn’t let all of that research and information go to waste. So I am sharing it with you! Plus, in order for your cookies to be The Ultimate Chocolate Chip Cookies you can’t skip a single step or substitute any ingredients! A few weekends ago I was at my families house and I made chocolate chip cookies – note they weren’t ultimate. I ended up having to make 5 alterations – for a variety of reasons – and they just weren’t the same. 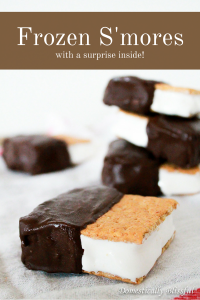 Even something as simple as using foil with oil instead of parchment paper can make a world of difference! What is the point of a chocolate chip cookie if it doesn’t have lots of big chocolate pieces in it? 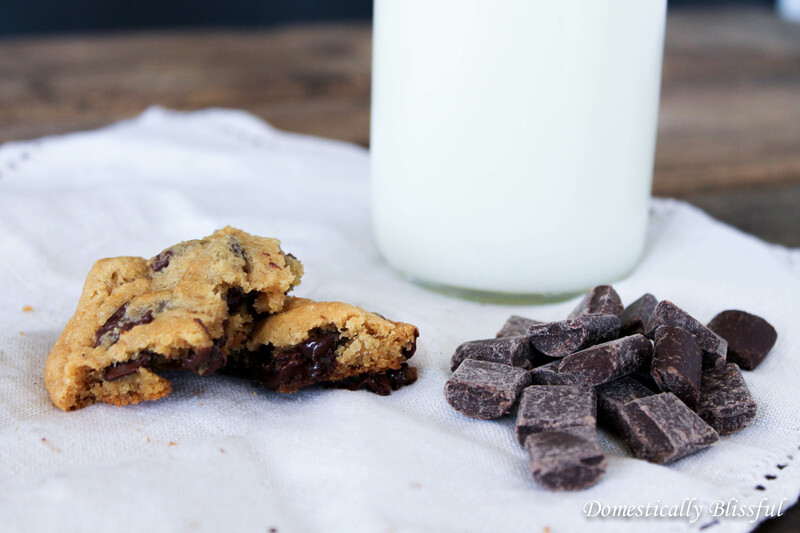 That’s why this Ultimate Chocolate Chip Cookies recipe uses 2 and ¾ cup of chocolate chunks. 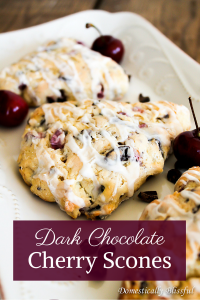 Now of course you could use your favorite chocolate or a variety of chocolate – or whatever you have on hand – but I would definitely suggest that you try using chocolate chunks at least one time when making these cookies – and I’m sure you will be making these a lot! Oh and even though this recipe already calls for a lot of chocolate chips, you can always add more once they have been scooped as you see fit! Normally cookies are made with just all-purpose flour, but these cookies are no where near the category of normal. By using the bread flour – along with all-purpose flour – your Ultimate Chocolate Chip Cookies will be more delightfully chewy. Of course, if you are out of bread flour you can do 2 ½ cups all purpose flour instead, but you will lose some of the ultimateness of your cookies – yes I do like to make up words! Now I know some people have a special love for shortening when baking – and while perfecting this recipe I did try a ratio of ½ cup butter and ½ cup Crisco – but when it comes to this recipe a good quality salted butter is going to go a long way in flavor and quality. However, I will not judge you if you decide to do the above ratio. 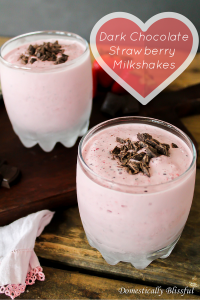 Before I perfected this recipe Roger thought the recipe involving Crisco – and some other modifications – was amazing and he didn’t want me to change anything else… I can’t even begin to explain how wonderful his praise is of the perfected recipe! My ego has definitely been boosted because of these cookies! While researching I found that brown sugar has more moisture than white sugar and while experimenting, I found that dark brown sugar has a richer flavor and nicer texture – especially when using fresh dark brown sugar. Of course using all brown sugar would not only affect the flavor and texture, but also the color, which is why the The Ultimate Chocolate Chip Cookie uses both types of sugar. By adding an extra egg yoke to the mix the cookies become even more fudgy and chewy. 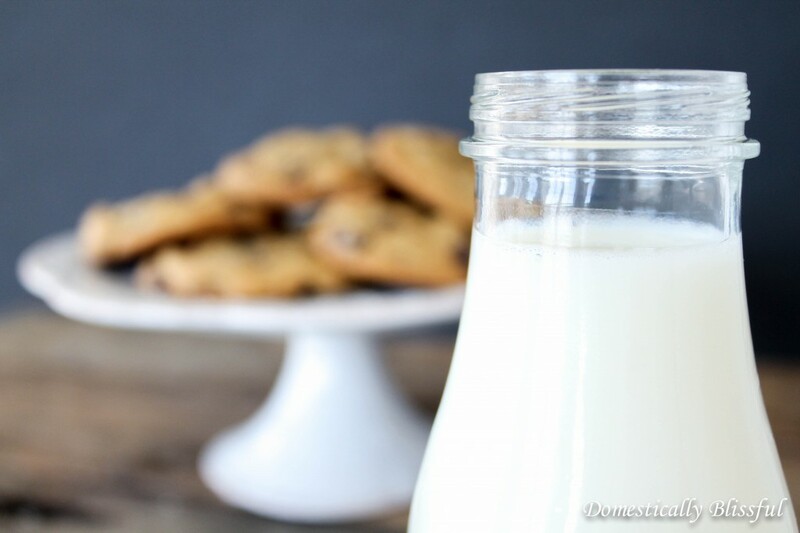 The secret ingredient to these Ultimate Chocolate Chip Cookies that makes them rise so well and gives them an extra chewy texture is cornstarch! I know it might sound crazy, but cornstarch is truly a magical ingredient! 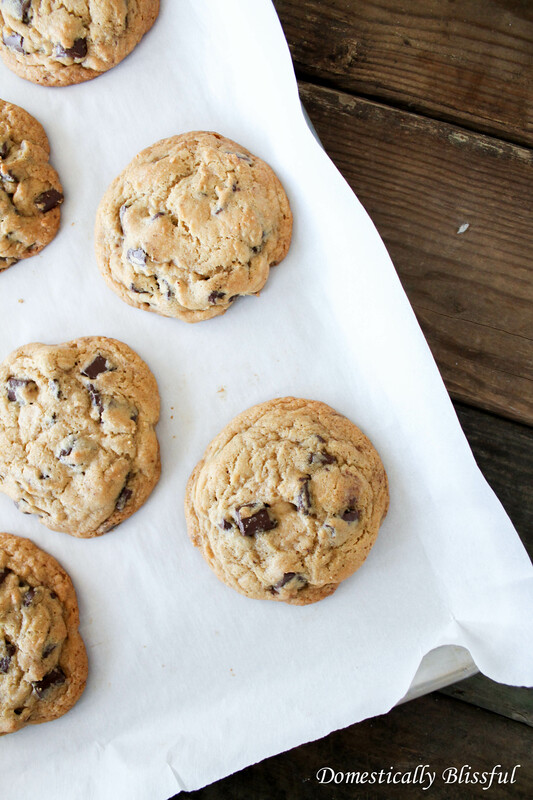 This one special ingredient does so much for the Ultimate Chocolate Chip Cookies. 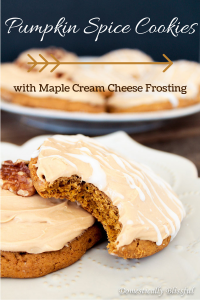 The cornstarch in this recipe gives the cookie a delightful lift making them soft, fluffy, chewy, and absolutely unforgettable! Chilling the dough before baking helps to keep the dough from spreading too much in the oven –nobody likes a flat cookie! To be honest I usually have a hard time waiting 2 whole hours… but the more thoroughly chilled your dough is the better it will bake. 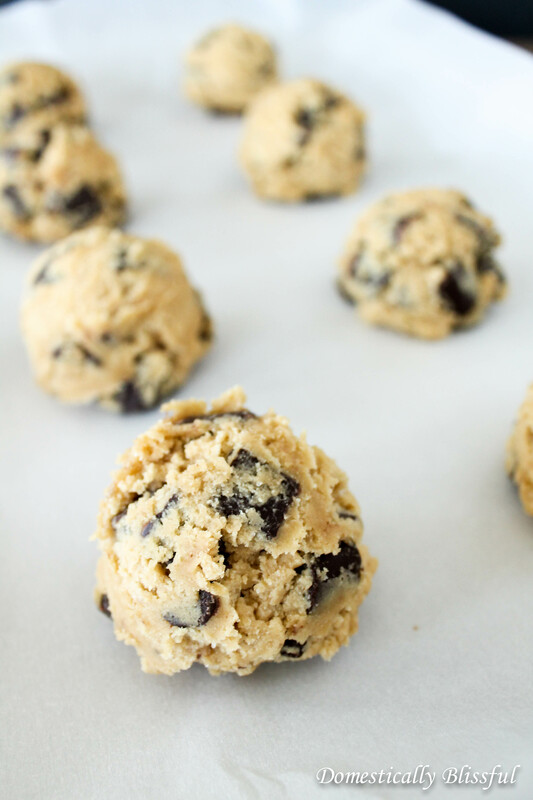 The Ultimate Chocolate Chip cookie dough can stay in your fridge (covered) for 48 hours. I like to make a half batch of cookies on Friday and just bake them as we want them over the weekend! 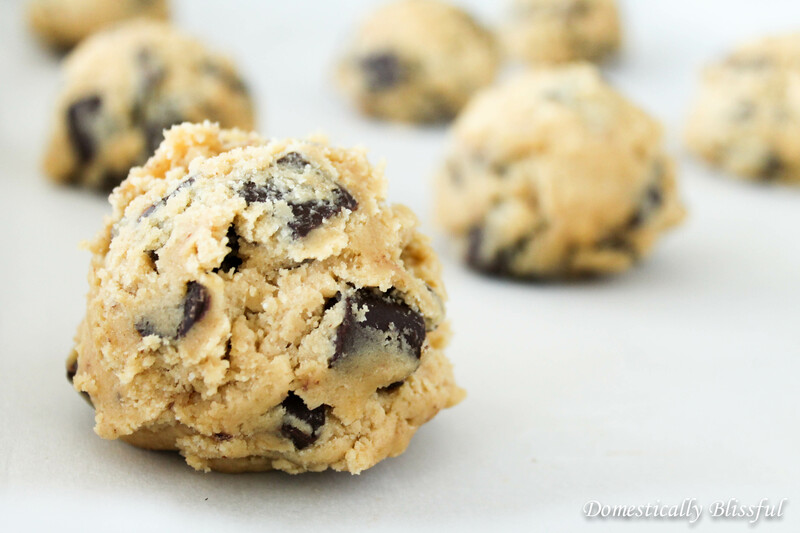 Another cookie trick that I grew up with my mom teaching me was to freeze the cookie dough. She would make a large – and I mean gigantic – recipe of cookies and then my sister mom and I would sit and use little ice cream scoops to shape the cookies. We would then roll them in sugar and place them on a pan to freeze. Once they were frozen, we would bag them and put them back in the freezer. This way we could bake as many or as little as we wanted whenever we wanted freshly baked cookies! 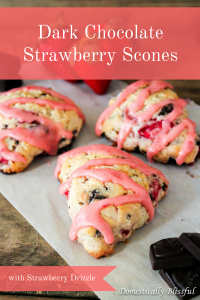 HOWEVER, this also highly decreases the taste of these ultimate cookies, so if you have to make a bunch in advance than go ahead and freeze them, but if you want a perfect cookie, these need to be freshly pulled out of the refrigerator, NOT the freezer. For cookies that are uniformly shaped we use a large ice cream/cookie scoop – our scoop can hold 1/4th of a cup of cookie dough. The key is to make sure that your cookie dough starts out tall and not too wide – note the dome shape – so that when the cookies are baking they will bake into a thick, chewy, cookie without too much spreading. Sometimes – when I feel like playing with my food, which is often – I will make my cookies extra thick by pushing the bottom/wide part of the cookie in a little so that the uncooked cookie is the same size from top to bottom. Tall cookies equal thick cookies. Just remember that the longer your cookie dough sits out, and the more you play with it, the more it will lose it’s chill – and thus it will spread more when it bakes. Note: The colder the dough the harder it will be. When the dough has been chilled for a long time you might need to use a good sturdy spoon to scoop out bits of dough and press into the cookie scoop. Because the cookie dough balls are going to be large they are going to need room on your cookie sheet. Even when using a large cookie sheet you won’t be able to bake all or even have of the cookies at one time. 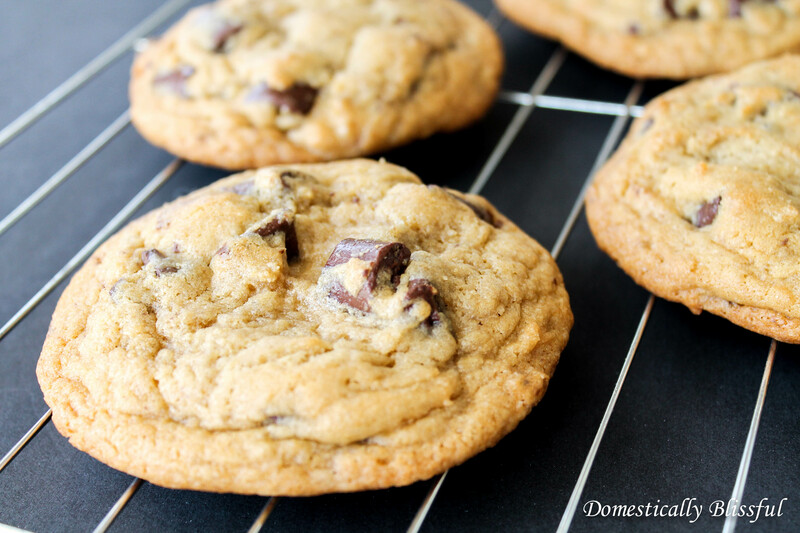 The best way to go about baking your Ultimate Chocolate Chip Cookies is to use 2 large cookie sheets and 1 large piece of parchment paper – foil sprayed with oil is another alternative, but not as effective at preserving that perfect cookie taste. After baking one sheet of cookies on the middle shelf of your oven you can place them on a cooling rack. Then slip the parchment paper onto the cool unused cookie sheet, scoop more cookie dough, and bake a second batch while your first cookie sheet cools to room temperature – make sure to keep the dough refrigerated in between. The colder/harder your dough the longer it will take to cook. If the dough is barely chilled it might only take about 10-15 minutes, but for solid cold dough it can take 15-20 minutes. Sift the 1 ½ cups all purpose flour, 1 cup bread flour, 3 teaspoons cornstarch, 1 teaspoon baking soda, 1 teaspoon baking powder, and 1 teaspoon salt into a bowl. In a separate bowl use a hand mixer to blend the butter, slowly adding in the white sugar and then the brown sugar to make a nice thick cream. Next, add one egg at a time, including the yoke – blending until combined between each addition – then blend in the vanilla extract. Stir in – by hand with a spoon – the dry ingredients just until combined, but don’t over mix. Then blend in the chocolate chips until they are evenly dispersed. Refrigerate for 2+ hours. I have seen recipes where they call for 24, 36, 48, or even up to 72 hours of refrigeration. Use a large cookie/ice cream scoop to measure the cookie dough for uniform cookies and bake at 350° for 15-20 minutes. If your chocolate chip cookie dough isn’t completely chilled the cookies will bake faster and spread more – see notes above under Shaping and Baking for more information about cold dough, spacing, and bake time. 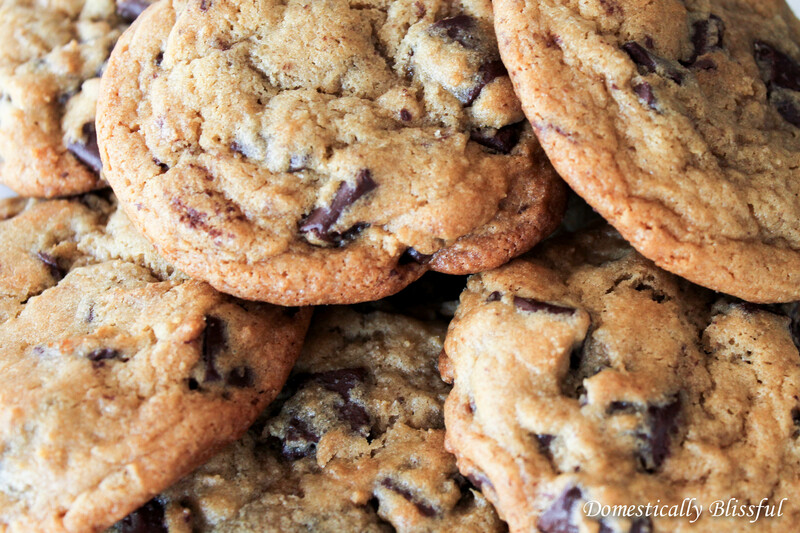 Your Ultimate Chocolate Chip Cookies are done when they begin to turn golden brown – they will still be hot when you pull them out of the oven and will continue to cook so make sure not to over bake them! 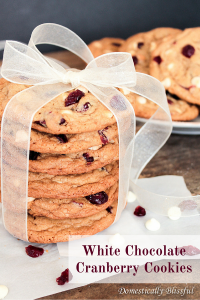 I’d love to see your Ultimate Chocolate Chip Cookies! Instagram your Domestically Blissful inspired recipes & DIY projects with the hashtag #DomesticallyBlissful & you might find your picture featured on DB’s Instagram! 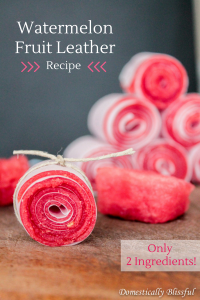 Great tips, they really do look like the perfect cookie! Thanks Sue! 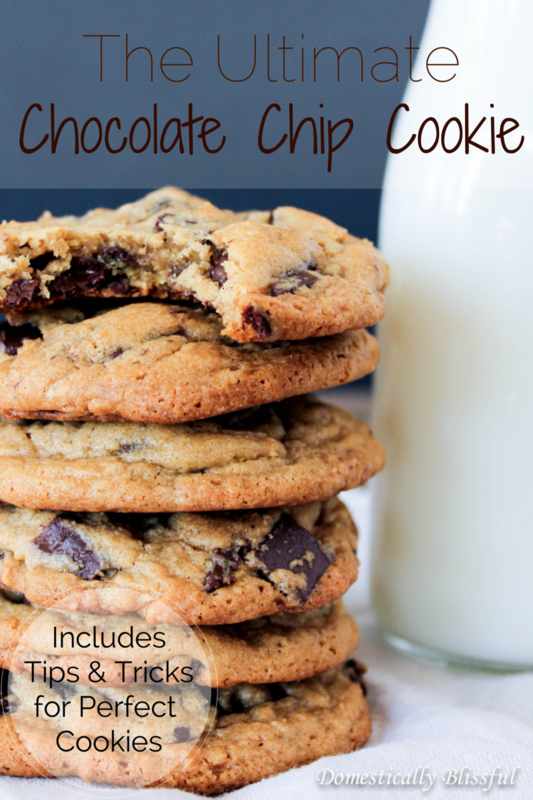 I hope you get a chance to try these Ultimate Chocolate Chip Cookies! they look like great choc chip cookies. yum!